This brand new, shorter edition of the critically acclaimed work includes J.R.R. Tolkien's complete draft manuscript of `The Hobbit', together with notes about its history, and is perfect for readers of all ages wishing to know more about how he came to write his beloved masterpiece. J.R.R. Tolkien's The Hobbit is a tale that "grew in the telling", and many character and story threads present in the published book were completely different when Tolkien first read the story to his young sons as part of their "fireside reads". 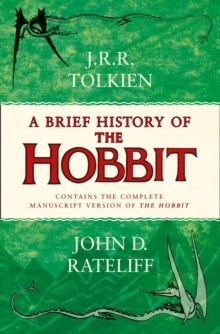 A Brief History of The Hobbit presents that original manuscript version of The Hobbit, and this is accompanied by John D.
Rateliff's lively and informative commentary, which looks at the story behind Tolkien's tale. As well as recording the numerous changes made both before and after publication, it examines - chapter-by-chapter - why those changes were made and how they reflect Tolkien's ever-growing concept of Middle-earth. The original account of where Bilbo meets Gollum and steals the ring from him is reprinted here, as are little-known illustrations and maps that Tolkien produced for his own reference when drafting the story, together with his later attempt to recast The Hobbit into the style of The Lord of the Rings. This invaluable companion to one of the most treasured stories in English literature offers fascinating new insights to those who have grown up with this enchanting tale, and will delight those who are about to enter Bilbo's round door for the first time.